Thank you for visiting today. If this is your first visit, take your time and look around. We trust we've provided important information and resources you're looking for. If you are a return visitor, thank you! We would love to hear from you and learn how we can serve all your real estate needs or do what we do better! Should I include an inspection contingency in my offer? An "inspection contingency" protects you as a buyer in a purchase offer by allowing you to cancel closing on the deal if an inspector finds problems with the property. As soon as the seller accepts a written offer, the document becomes a legally binding contract. The purchase contract can be written to include a contingency for any repairs found to be needed or related items the seller must take care of before closing. If these are not dealt with, and you have such a clause in your contract, you can delay or possibly cancel the closing. If it's not stated in the contract, you could face losing your deposit. There also may be costly legal implications stemming from backing out of a contract. You usually will have the right to choose the inspector (and be responsible for paying for the inspections). In addition to an overall inspection for structural soundness, you can request a satisfactory pest control inspection report, roof inspection report or contingency for no potential environmental hazards such as asbestos or radon gas. Contingency clauses should satisfy the concerns of both the buyer and seller. 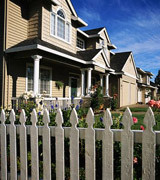 Buyers also can protect themselves by inserting additional necessary contingencies. Indicate which items like curtains and appliances are to remain with the house. Then stipulate you have the right to personally inspect the home 24 hours before closing to make sure all is in order.